Remove the existing XML code from the file activity_science.xml and write the following code in the layout file. You will notice 3 strings marked in red, do not worry about them right now, we will come back to that later. On changing the layout xml file you will notice that the preview has also changed. Each of the XML elements, namely LinearLayout, TextView and Button represents a widget and their XML attributes defines how the widget will be configured, like what text to show in the TextView, is configured by android:text attribute. Same is the case for text to be displayed on Button widget. Let&apos;s try to understand the layout. As we can see from the above XML, LinearLayout is the root element, which has height and width equal to the device screen defined by the attributes android:layout_width="match_parent" and android:layout_height="match_parent". Also it defines the orientation for its child elements to be Vertical. the two child widgets of the root LinearLayout are a TextView and another LinearLayout. The child LinearLayout has further two childs, Button which are horizontally placed inside the LinearLayout as it is defined as an attribute android:orientation in the child LinearLayout. We have also specified android:id attribute for the two Button widgets. This is done, so that we can reference and use the buttons in our Activity class, we will see how to do that in the next tutorial. 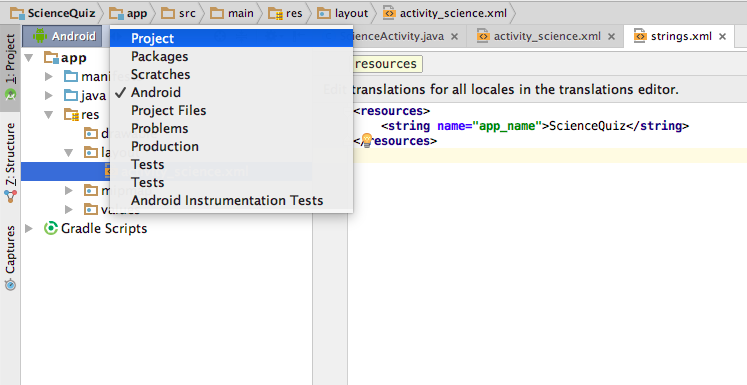 In every Android project one strings.xml file is already added. In the Project tool window, in your project, find app/res/values if you have selected the Android style structure, and app/src/main/res/values if your Project tool window is in Project view. 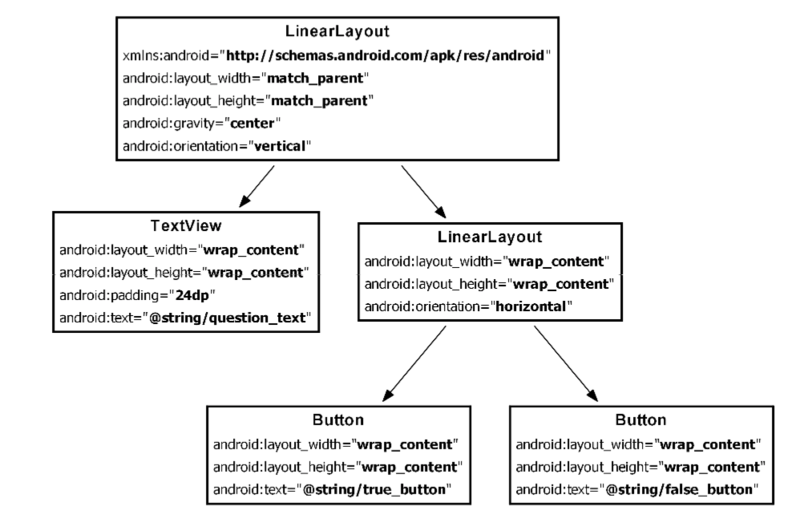 If you do not know how to switch between Android package structure and Project, follow the below image. Graphite is used in making Pencils. As you create these 3 strings in the strings.xml you will see that all the errors in your layout_science.xml file will be resolved. If we want we can also have our own separate strings xml file with any name, but it should be located in res/values/ directory.